Honored with the American Dance Guild Award for Artistic Excellence, Buglisi Dance Theatre is distinguished for poignant, theatrical repertoire and imaginative multi-disciplinary collaborations which fuse classical sensibility with intuitive creativity. The company was founded by Artistic Director Buglisi, Capucilli, Dakin and Foreman, who performed together as Principal Dancers at the Martha Graham Dance Company. BDT presents its home seasons at The Joyce Theater, NYC’s preeminent venue for contemporary dance, where the company celebrated its 20th anniversary season on February 5-10, 2013. World-class production values and theatrical appeal have won BDT invitations worldwide to the John F. Kennedy Center for the Performing Arts; Jacob’s Pillow Dance Festival; the Sosnoff Theater at the Richard B. Fisher Center for the Performing Arts, Bard College; The Kravis Center, West Palm Beach; SUNY Purchase Performing Arts Center; Evening Stars Festival; the Vail International Festival; the Society of Performing Arts, Houston; the Baryshnikov Arts Center; The Juilliard Theatre; Lincoln Center; Dance St. Louis’s Spring to Dance Festival; the Yale Center for British Art; and abroad to festivals in Australia, France, the Czech Republic, Israel and Italy, reaching over 25,000 people annually in live performance BDT expands its service to the community with site-specific performances at such venues as The Whitney Museum; the steps of Federal Hall and New York Stock Exchange for the LMCC/River to River Festival; Battery Park for The Downtown Dance Festival, NYC; Utica College football field for the Special Olympics Opening Ceremony; and Dancing at the Crossroads in Times Square. On September 11, 2011 and 2012, Buglisi Dance Theatre led 120 dancers on the Josie Robertson Plaza at Lincoln Center in The Table of Silence Project 9/11 to honor peace and tolerance in our world. This public tribute from the NYC dance community was broadcast via live stream and can be viewed at youtube.com/buglisidance. Subsequent site-specific commemorations were held at the Pan Am 103 Remembrance Wall at Syracuse University and in Assisi, Italy. Artistic Director Jacqulyn Buglisi believes that movement is a basic element of human expression and that joy and inspiration flow from its wellspring. “Using images, literature, poetry, heroic archetypes and a consuming physicality, I craft dances that explore human relationships revealing the bold visceral strengths, humor and exquisite vulnerabilities of the individual. My dances such as Requiem, Letters of Love on Ripped Paper, Wild Mannequins & Wing Walkers; Rain, Sand, Acapelorus, Frida, and Suspended Women represent my dream to embrace the integration of art forms through the collaborative process and current multi media technologies and my passion to inspire, engage, and attract the next generation of artists and diverse audiences into the realm of theatrical dance theatre. Committed to connecting the global community, BDT has a long history of multi-disciplinary and multi-cultural collaborations with artists of the highest caliber including innovative composers Tan Dun, Jennifer Higdon, Libby Larsen, Daniel Bernard Roumain, Daniel Brewbaker and Glen Velez; cellist Maya Beiser; the Cassatt String Quartet, and the New York Choral Society. Fundamental to BDT’s mission are its interactive educational residencies and community outreach programs which allow the company to share its creative process with educational institutions, and community’s across America, including the SUNY Purchase Conservatory of Dance; Class Acts St. Petersburg Mahaffey Theater; Munson Williams Proctor Arts Institute; Boys and Girls Club of America; Mohawk Valley Center for Refugees; Kaatsbaan International Dance Center; California State University/Long Beach; George Mason University; University of Richmond, Jacques d’Amboise’s National Dance Institute; The Julliard School, Ailey/Fordham BFA program, and the NYC Public Schools. In recognition of BDT’s contribution to the American dance field, the New York Public Library for the Performing Arts at Lincoln Center films and archives the company repertoire for public viewing in the Jerome Robbins Archive of the Recorded Moving Image. Fundamental to the Company’s mission are its interactive educational residencies, workshops, and outreach programs which allow the company to share its creative process with educational institutions, and community’s across America, Syracuse University, California State University/Long Beach; George Mason University; University of Richmond; Jacques d’Amboise’s National Dance Institute, Jacqueline Kennedy Onassis High School, NYC: the Mohawk Valley Resource Center for Refugees; the L. I. Children Museum, SUNY Purchase, the Joyce Theater Educational Residency, Stamford Center for the Performing Arts, Western Washington University, Cornish College, Seattle, Dance Masters Wesleyan University, Miami New World School of the Arts, Florida State University, Hospital Audiences, Contemporary Traditions at Jacob’s Pillow, Contemporary Voices and Visions at Hamilton College, New Dances at the Juilliard School Lincoln Center, Ailey/Fordham BFA program; NYSCA long-term residencies at Kaatsbaan International Dance Center and Munson-Williams-Proctor Arts Institute; New Orleans Center for the Creative Arts, and the American College Dance Festivals, and more. BDT is deeply honored to receive grants from the National Endowment for the Arts, the New York City Department of Cultural Affairs, and the New York State Council on the Arts, The Arnhold Foundation, the Howard Bayne Fund, the Shubert Foundation, and the Harkness Foundation for Dance, and Altria’s Women Choreographer Award for Jacqulyn Buglisi’s body of work. Through all of its programs and performances, BDT continues to build the legacy of American culture, striving to nurture within the community a personal commitment to dance as a lifelong process of discovery. Buglisi…works in images that seduce the eye as much as the imagination, with shapes, luminous textures, and stilled moments in time that offer an adventure in perception. Buglisi is a rarity in today’s world, a woman who delights in the many splendid forms of female being. Probably no woman, other than Graham, has plumbed such emotional depths choreographically. In her four decade long career, Buglisi has made an indelible impact on the field of dance. Renowned for highly visual, imagistic dances that use literature, history and heroic archetypes as a primary source, Buglisi’s ballets are sweeping, passionate and always rooted in a strong physical technique. She is a prolific choreographer creating more than 100 ballets for Buglisi Dance Theatre and commissioned worldwide including Suspended Women on the Alvin Ailey American Dance Theatre (premiere: 12/12/14 at New York City Center); Ninfee for the Richmond Ballet; her full-length The Four Elements for the Flamenco Festival presented in Madrid, Sadler’s Wells, London and New York’s City Center; Ananda Shankar Performing Arts Company, India; the Shanghai Song and Dance Ensemble, China; the Martha Graham Dance Company, North Carolina Dance Theatre, Joyce Trisler Danscompany, Teatro Danza Contemporanea di Roma for which she was a co-founder in 1969; American Repertory Ballet; Ailey II; and Ice Theatre of New York. Her “bewilderingly beautiful” ballet Threshold had its Italian premiere in Milan with Carla Fracci's Italian Ballet Company at the Teatro Nuovo and at the Brooklyn Academy of Music, Opera House. Buglisi, with Foreman, premiered their full-length ballet Runes of the Heart at Lincoln Center in 1994, followed by invitations to the Kennedy Center, Jacob’s Pillow Dance Festival, and The Joyce Theater where Buglisi Dance Theatre performs its NYC seasons. In 2001, she created Requiem to the soaring music of Gabriel Fauré, a transcendent experience and amplification of the human spirit. Anna Kisselgoff raves in The New York Times of the ballet’s powerful images, stunning...extravagant and beautiful. Breaking new ground, Buglisi collaborated with Venezuela’s leading environmental artist Jacobo Borges to create her trilogy Blue Cathedral, Rain, and Sand. She has collaborated with composers Tan Dun, Glen Velez, Jennifer Higdon, Daniel Bernard Roumain (DBR), Libby Larsen, Daniel Brewbaker, Reza Vali; Andy Teirstein; cellist, Maya Beiser; Flamenco Guitarist, Gerardo Nunez, the Cassatt String Quartet, the Syracuse University Symphony Orchestra and Singers; lighting designers Clifton Taylor and Jack Mehler; mannequin maker Ralph Pucci; and Italian artist Rossella Vasta on the Table of Silence Project 9/11, a site-specific ritual for peace performed at Lincoln Center by 158 dancers and nine musicians, and seen via live stream across the U.S. in 45 states and worldwide in 82 countries. For her contribution in uniting the dance community through the Table of Silence, Buglisi was named a “New Yorker for Dance” by Dance/NYC and received Proclamations from Governor Andrew Cuomo and Mayor Bill de Blasio. 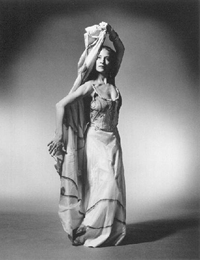 During her 30 year association with the Martha Graham Dance Company, Buglisi was a Principal Dancer for 12 years, performing the classic roles and those created for her by Miss Graham. She danced in Ms. Graham’s honor on the nationally televised CBS Presentation of the Kennedy Center Honors and the PBS film An Evening of Dance and Conversation with Martha Graham. Buglisi’s duet “Sospiri” was performed by the Martha Graham Company at New York City Center (1989). Coached by Jane Sherman, she performed Ruth St. Denis’ solos internationally including Lyon Biennale De La Danse and on film in Trailblazers of American Modern Dance, and The Spirit of Denishawn. A master teacher committed to arts-in-education, she received commissions by the University of Richmond, California State University/Long Beach, George Mason University, SUNY Purchase Conservatory of Dance, Interlochen Arts Academy, the State Ballet College of Oslo, Ailey/Fordham University B.F.A. Program, Oklahoma Arts Institute, the Juilliard School’s Emerging Modern Masters Series, Jacob’s Pillow Dance Festival, Boston Conservatory of Music, Randolph-Macon College and the National Dance Institute, among others. In 1970, she founded the first school of contemporary dance for the community of Spoleto, Italy and was the Master Artist-in-Residence at the Atlantic Center for the Arts. She has taught for the Dance Aspen Festival from 1990-95, the Julio Bocca Center in Argentina, the 97-98 Victoria College Melbourne, and the Chautauqua Institution and Festival. She is Chairperson of the Modern Department at The Ailey School for 25 years, served on the faculty of The Juilliard School 91 -05, The Martha Graham School since 1977 and guest teaches at the famed Performing Arts High School (alumna), Steps on Broadway, and Peridance Capezio Center. She was named Honorary Chair for the Marymount Manhattan College ‘05 Gala and served as panelist for the Heinz Awards and the New Jersey State Council for the Arts. She served as a Grand Marshal of the 2013 Parade in NYC. Buglisi’s repertoire is archived in the Jerome Robbins Dance Collection of the New York Public Library for the Performing Arts. Awards and honors include: 2014 Kaatsbaan International Playing Field Award, American Dance Guild Award for Artistic Excellence, Fiorello LaGuardia Award for Excellence, The Gertrude Shurr Award for Dance, Altria Group’s 2007 Women Choreographer Initiative Award, National Endowment for the Arts fellowships, commissioning grants from the Harkness Foundation for Dance and The O’Donnell-Green Music & Dance Foundation, and challenge grants from the Arnhold Foundation, among others. Ms. Buglisi served for three terms on Dance/USA’s Board of Trustees as Chair, Artistic Directors Council (2010-2013).